Some clown gets all the luck. That evil smile on his face says it all. 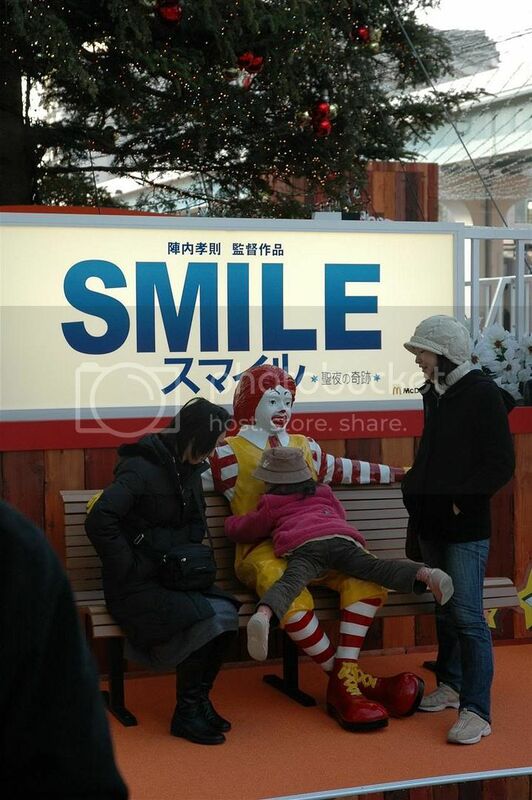 Now we know why every Ronald sitting down is always happy. apparently some girls digs that. lucky clown. why? hope it’s not because he got a kiss. lol. a medio ronald will scare the kids and all customers away. he aren’t as friendly looking as colonel sanders. the thought of it scares me. what’s wrong with the girl’s face? Reminds me of a photo I took in Japan. We all know he’s a lolipedo. bah the link got cutted off. If that didn’t work, the picture is somewhere here. either very pretty or the opposite LOL! Hmm.. Must get me a bench and cosplay as Ronald one day..
chun, no comments on this. That is one satisfied clown.. No wonder he is smiling.. Lucky idiot.. But why Ronald Mcdonald when the Colonel (KFC) is more handsome than he is?? i’m not sure if KFC display statues of Colonel Sanders around here. do they? no i don’t know the girl. this pic was stolen was don’t know where. More reasons for me to hate clowns now. hey should all just disappear. i thought i left a comment. anyway, i was saying since u got that pic from duno where, can i use it for my blog? another clown hater. am i seeing a trend here? lol. For once let him be… With all the crap he went through. I guess he needs a bit of happiness like everybody else. Or that she is a spy on a mission whispering him some top secret information (don’t ask me what though, I don’t know). By the way, there is a very odd-placed water bottle on the picture. Try to find where it is.